Laguna Beach and Huntington Beach’s favorite Pizza Lounge, serving brick oven gourmet pizza, unique salads, tasty sandwiches, homemade meatballs and hand-crafted cocktails has recently opened at Tivoli Village. Local entrepreneur, Ken Henderson, partnered with Gary Decker, the founder of Pizza Lounge, to bring the restaurant to Las Vegas. With the new 1,900-square-foot restaurant, Henderson integrated his own personal touch to make the Pizza Lounge at Tivoli Village unique. An extensive wine list features highly-rated selections, including more than 20 wines by the glass, and there are more than 10 craft bottled beers and 13 craft beers on tap. The dim lighting, contemporary décor and eclectic music make Pizza Lounge an ideal spot for date night or an intimate dinner with friends in a setting that is seemingly worlds away from the Las Vegas Strip. Walls of glowing candles welcome guests to Pizza Lounge, where a spacious patio frames two sides of the restaurant. The intimate dining room seats 60 guests at tables and at the bar, and the patio seats 30 guests. That number will triple to 90 guests in about a month with the completion of Tivoli Village’s second phase and the addition of a lush new park next to Pizza Lounge’s patio, offering a serene setting for lunch, dinner or late-night dining. The custom hardwood tables lend an upscale feel, as well as comfort for lounging, to the atmosphere of Pizza Lounge. The dining room is accented by four crystal chandeliers, a sparkling contrast to the rich brown floors and granite and wood countertops. A message board allows guests to buy drinks for friends in their absence, and high-definition televisions broadcast unique content, such as atmospheric videos of the ocean or a fireplace, or haute couture fashion shows. Available in personal, medium and large sizes, with the option to select a gluten-free crust in the personal size, the pizzas are prepared in brick ovens and available in more than two dozen combinations. 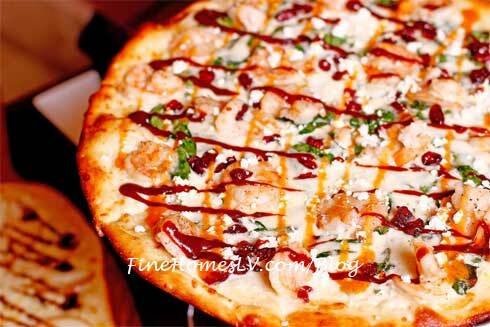 Henderson’s favorite is the Chipotle Shrimp, topped with layers of spinach and creamy white chipotle sauce, shrimp, cranberry, goat cheese and mozzarella, drizzled with barbeque sauce. Other specialty pizzas include Homemade Meatball, topped with house-made meatballs, mushrooms, chopped Roma tomatoes, red onion and fresh mozzarella cheese; and Santa Fe Taco, topped with ground beef, baked Mexican beans, sliced Roma tomatoes, lettuce, taco chips and sour cream. 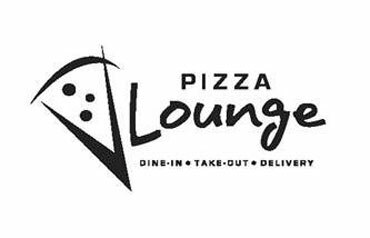 Pizza Lounge will introduce new “celebrity” pizzas on an ongoing basis, honoring Las Vegas’ many local celebrities. Guests may also select toppings to create their own custom pizzas. The eatery also serves an array of delicious salads including Our Famous Pear and Gorgonzola Salad, a mix of crispy mixed greens, gorgonzola cheese, shaved pears and candied walnuts served with balsamic dressing; and the California Bacon Salad, a bed of fresh greens topped with bacon, chicken and chopped tomatoes, served with house-made ranch dressing. Pizza Lounge’s tasty sandwiches and pasta dishes include Lobster Ravioli Gorgonzola, cheese ravioli tossed with lobster and creamy brandy hazelnut and gorgonzola sauce; and the Grilled Chicken Aioli and Brie Sandwich, a grilled chicken breast topped with melted brie, lettuce and tomato and served with herb aioli. Pizza Lounge’s small plates include Homemade Meatballs and Whipped Potatoes, baked in marinara sauce and melted Parmesan cheese; Baked Brie and Fig Flatbread, made with brie and fig spread on honey pizza flatbread; and Lobster Mac ‘n’ Cheese, made with fresh cheddar and parmesan cheese, cream, butter and spices, and then topped with chunks of tender lobster, and several more. Side dishes include Grilled Vegetables, Sweet Potato Fries, Pretzel Bread, and more. Pizza Lounge’s mouthwatering dessert menu includes its signature Chocolate Pizza, Homemade Apple Crisp paired with vanilla ice cream, a decadent Flourless Chocolate Raspberry Torte, Chocolate Mousse Cake and more. In addition to its many wine and craft beer selections, Pizza Lounge serves an array of hand-crafted cocktails including The TyKulada, made with TyKu coconut negori, fresh pineapple juice, crème of coconut and a squeeze of lime; and the Wet N Wild, made with Sandeman ruby port, muddled raspberries, fresh lemon, Orgeat syrup, finished with an almond crème soda and served over ice in a wine glass.